After my salsa teacher Jerry read my post about making his tomatillo salsa, he sent the following recipe for the spicy salsa I didn’t commit to memory during our Mexico City trip. For those who like it hot, enjoy! For the hot chile and oil, just as easy. Find the long thin small red chilies. They are dried whole and sold loose or in pre-packaged cellophane bags. In Mexico “chiles de arbol” or I’ve seen them in English “Chinese chiles.” You can use any other dried chiles as well for different flavors — chile pasilla, chile guajillo, ancho. Find them in a Mexican grocery. Heat a pot of good oil (I always used olive) to just shimmering or just before smoking. Take off the heat and let cool a bit. Take as many dried chiles as you want — both in terms of heat and consistency (more is hotter, more concentrated and thicker). Throw them in the oil and stir to get them somewhat submerged into the oil. They should almost fry but not burn. Throw in a clove or two of garlic, and it will brown a bit. Let it all cool down — either completely or until warm. This finishes the infusion. Put all into the blender to liquify completely. Depending on your taste, you can leave some seeds “visible” or process until not visible (I usually completely liquified it). Then, into your jar or serving dish and … voilá. Like the green salsa, this is more of a sauce condiment than a tortilla-dipping salsa. With either the green salsa or the chile oil salsa, blend with sour cream (or crème fraiche) and softened cream cheese for a spicy chip dip. I blame my mother for having recently made twice as many mashed potatoes as two people could possibly eat. We were on the phone as I was peeling potatoes, and she convinced me that four potatoes probably wasn’t enough. So I threw in another one, bringing the total to five. Again, for two people. Ridiculous even when you consider how much Mike likes (make that loves) mashed potatoes. Growing up, second day mashed potatoes meant hamburger pie, otherwise known as my least favorite meal ever. Imagine ground beef mixed with tomato soup mixed with green beans and topped with mashed potatoes then baked in a Pyrex bowl. I know, gross. But Googling “leftover mashed potatoes” yielded a super fast and easy — and far less disgusting — solution: gnocchi. After reviewing a few recipes, I surmised that I simply needed to mix the leftover mashed potatoes with about half the amount of flour and one egg. I eyed instead of measured the mashed potatoes, estimating there to be just over two cups, so added the egg and a little over a cup of flour. After I mixed it with a fork, I kneaded the dough by hand until I had a non-sticky ball. 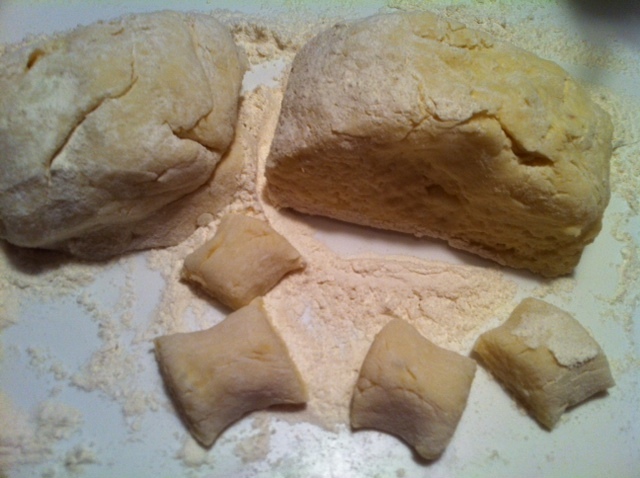 I divided it into three equal portions, then rolled each into a rope the thickness I wanted for my gnocchi and cut it into 1-inch pieces. The cooking was even easier. I simply added the gnocchi to a pot of salted, boiling water and waited for the gnocchi to float to the surface. I topped the cooked gnocchi with a jar of sauce stashed in the pantry, and added a side of steamed broccoli. Quite possibly the easiest dinner I’ve made in eons. Next time, and there will be a next time, I’ll experiment with adding a spice to the dough — Mike thought it was delicious but “missing something.” Still, an impressive first effort.